Finahub Official Blog: How Aadhaar Esign and Ekyc made Reliance Jio the fastest growing company? How Aadhaar Esign and Ekyc made Reliance Jio the fastest growing company? Reliance Jio is growing exponentially. As of date, it has already reached 1.5 core customers in a month's time. No company in India has grown this fast. Per day they are signing up 5 Lakhs plus customers. There are several reasons for this growth, but the most important is the way they made use of the Aadhaar platform. The two most important things that made this possible are below. They have used it effectively which enable them to onboard customers in less than 3 minutes time. Customers are walking out of the showroom with a working mobile connection which was not possible earlier. Following are the advantages aadhaar brought to Jio and its customers. The sales representative is using just a mobile app for the entire customer onboarding. So it's fully paperless. The sales agent first signs in using Aadaar authentication later asks customer waiting for him for his Aadhaar number. Then do an Ekyc and finally an Aadhaar ESign to complete the process, The documents automaticaally get synced with the server. If the customer has a Aadhaar number there is zero paper work needed. No more filling up of forms and pasting photographs. Even the bill , incase you are buying a Wifi device is coming via email. No more photograph, signature, copys of Identity proofs, address proffs required. Customer just need to take that 12 digit aadhaar number with him (Not even the original or photostat of aadhaar card is needed) . 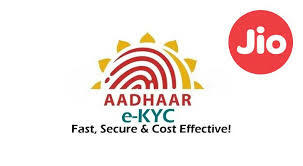 The entire process gets completed using Aadhaar Ekyc and ESign via biometric. The Aadhaar Ekyc and Aadhaar ESign and fully complaint with regulators like RBI, SEBI, IRDA etc. So any enterprise can make use of it to simplify their process. Earlier there were frauds happening when people takes mobile connections using the copys of identiity and address proof documents of other people , with out them getting to know about this. To counter this there were secondary verifications done by other agencies to issue a mobile connection. (over the phone or direct visit @ address location). This caused , the time taken to activate a sim card becoming days. But when coming to Ekyc and ESign, as its not using photocopys its tough for sales people to take a duplicate connection in your name.